So I confirmed my ornament arrived safe and sound for the HOE exchange. I am excited to show it off here. I will definitely be stitching this one again for myself. It was a Hands on Design piece from their chalkboard series. 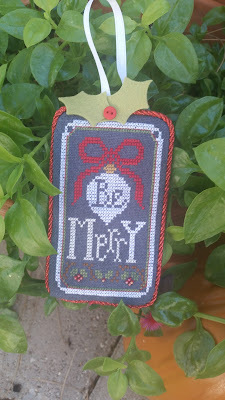 I hand dyed the fabric again for these, and finished it as a flat fold ornament. I loved the felt holly leaves and buttons that were included with the charts, and I added my own little Mill Hill beads along the bottom border for the holly berries. 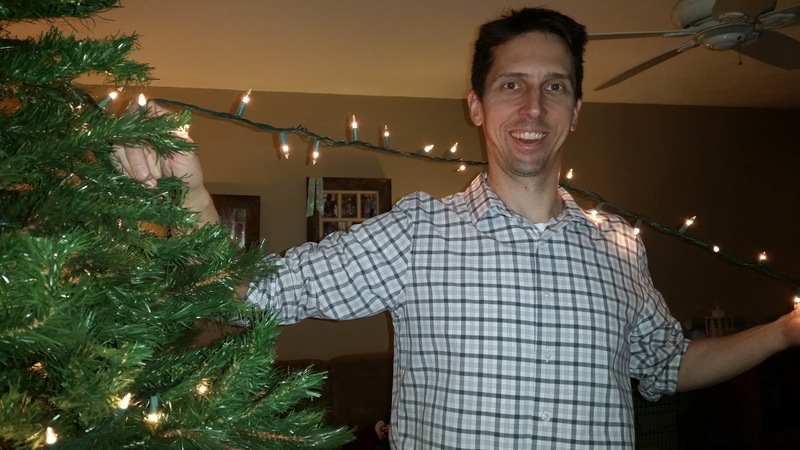 Last weekend was spent putting up our Christmas decor. 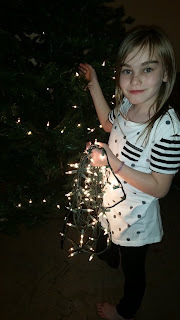 Here is my middle child stringing the lights on the tree. 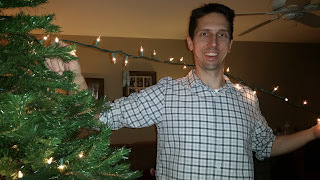 And below is my DH being silly with the same light strand. She did the bottom half and he strung the top half of the tree. Even our little guy got into hanging up the ornaments this year. 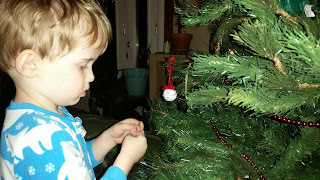 We also put out our dancing/singing Hallmark snowmen underneath the tree, and about every two seconds he turns them back on so our house has been filled with Christmas jingles already. 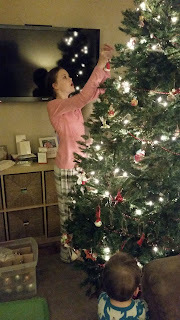 And my oldest, I can't believe she is tall enough already to hang the fragile ornaments high up on the tree safely out of brothers reach! 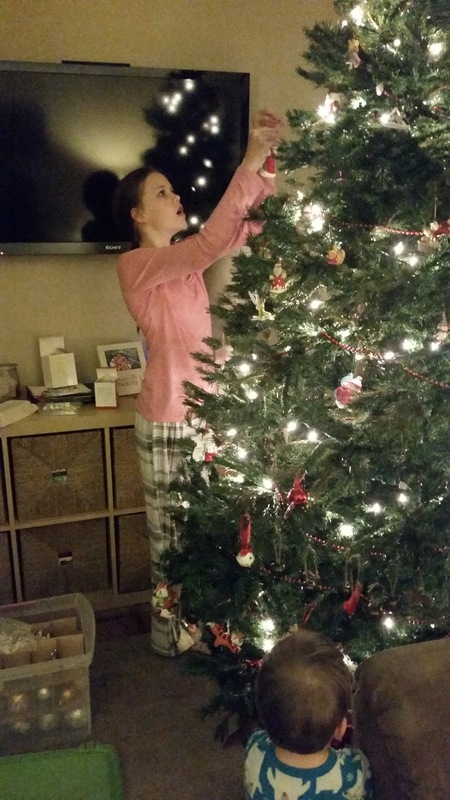 She is almost as tall as me already, but in my mind I still see her as a little toddler in footie jammies! 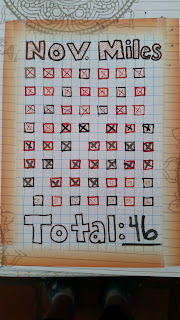 Almost there on "Blessings Sampler". All I have left is the back-stitching on the acorns, basket, and bottom two borders. There was supposed to be a butterfly along the top of the design, but I left it off as butterflies didn't seem very Autumn/Fall to me. So now I am considering what to put there instead. One of the other designs in this series has bees, and another has a crow which were my first choices. Maybe i'll just add a couple cute buttons up there. Anyway, happy to have this almost done. 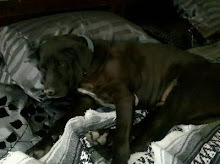 Here is a little early Christmas present I bought for myself. A framed/finished piece off of Ebay. I thought this would be a nice addition to my fall decor next year. You should have seen the box they shipped it in, you would have thought they were shipping me a missile or something there were so many layers of bubble wrap. It is a very pretty stitched piece, and the little pumpkin on the side of the frame just adds to the cuteness. I know I have talked about tracking and planning more. 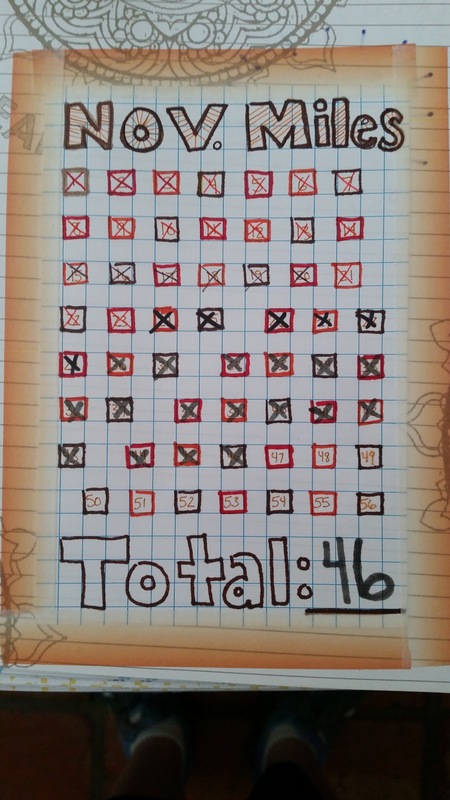 So here is one of my first efforts at tracking stuff. Just checking off how many miles I ran in the month of November. If I had known I was that close to 50 miles total I would have been better on my running. I have been working towards 5 miles on my long runs. Unfortunately the week of Thanksgiving was busy for me and I barely got a single run in. Below is the view across the lake on one of my long runs. 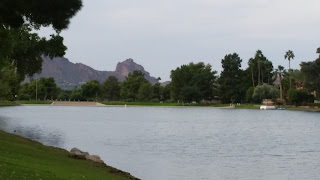 That is Camelback Mountain in the distance. This was before the weather here turned cold last week. Well I say cold, the high is supposed to be 70 today so i'm not sure I can call that chilly. For an Arizona girl it is though!